Here in the 21st century, technology is a given. It’s a part of our daily lives and it’s here to stay. It’s the perpetual innovation machine, evolving and changing, morphing into new forms at a sometimes alarming rate. If you own the equipment, as the saying goes, it’s already obsolete. Twenty-five years ago, though, the idea of a music program based on the creative possibilities of technology must have seemed like so much science fiction. But Paul Boylan, then dean of the School, saw into the future. And that future is now. Electronic music in Ann Arbor was not without precedent. In 1961, a group of courageous composers lit a spark with their now famous ONCE Festival of New Music (see ONCE article). Having no access to commercially available and affordable equipment, they made their own. Their work became seminal to the future of electronic music in America. Now fast forward to the early 1980s. Paul Boylan is on a trip to Los Angeles. He’s visiting the studio of alumnus Richard Perry (BM, ‘64), producer of artists like Rod Stewart, Art Garfunkel, Diana Ross, Carly Simon, and Barbra Streisand. He’s sitting in on a recording session. That’s when it hit him. “A young synthesizer player was providing much of the back-up for the session,” Boylan recalls. “I found his musicianship absolutely amazing. During a break, I asked him what music school he attended and learned, to my horror, that he had wanted to come to Michigan.” Not only did his transcript not meet the School’s requirements, but the curriculum he needed did not yet exist. Boylan came back to Ann Arbor determined to find a way for such musicians to develop their talent and artistry in a conservatory setting. He assigned faculty member David Crawford, conversant with computers in his work developing notations for early music, to chair a committee on feasibility. By 1985, the Regents had given the green light to a Center for Performing Arts Technology. David Gregory, then chair of dance, was brought in as new director. One of the first to venture into this new frontier, Gregory was already working with the developers of NeXT, the forerunner to Apple, on his own project, the Creation Station, designed to synthesize sound, video, and computer graphics for work in choreography. By the mid 1990s, though, Performing Arts Technology was starting to look like a better idea. With the advent of inexpensive digital chips, microcomputers were becoming both affordable and powerful enough to perform audio synthesis in real time. Gone were the computers of yore, room-filling mainframes that ran for hours or even days to generate a few minutes of music. When Gregory moved on to the private sector, Mary Simoni, fresh from the Berklee College of Music where she had been teaching, was brought in to direct the program. Simoni, Rush, and Crawford set to work to carefully craft a curriculum with a definitive degree trajectory. Today there are four undergraduate degree tracks and a master’s in media arts. Now, some 80+ students call themselves PAT majors. They divide their time between the E.V. Moore Building, home to the School of Music, Theatre & Dance, and the Duderstadt Center, started by Duderstadt and his wife Anne, a short walk away on North Campus, then, as now, a vital component to the work of PAT. And it’s a computer geek’s paradise. The “Dude” has video and audio studios with professional sound, lighting, and projection equipment; an industry-standard audio recording studio with a 48-channel API Vision surround-sound mixing and recording console; an electronic music studio with digital audio and MIDI workstations; a fully immersive Virtual Reality Cave. There’s also a new Surround Sound Lab, again made possible by a gift from the same donor. It’s a facility where multi-channel audio and video work can be created and viewed in surround and is compatible with the systems in the Music Technology Lab, at the Duderstadt Center, and the Hill Auditorium Recording Studio. Students in the program take acoustics and psychoacoustics, learning the basics of sound, human hearing and perception. They take sound recording at the Audio Studio at the Duderstadt, fully equipped to replicate a professional situation. 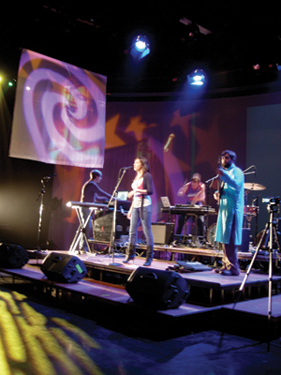 They take courses in computer music, multimedia, and intermedia composition, using their creativity, musical know-how, and technological savvy to create their own works. And they do. Jack Stratton, a percussionist and third-year PAT student, designed a virtual drum set that generates visuals when played. “Each hit of the drum is represented by a ring floating in space, like a Frisbee,” Stratton says. “The rings expand or contract based on how loud the drum is being played.” It was entered in a university-wide competition called Feel the Music to enhance the listening experience of the deaf or hearing impaired. Although it didn’t take the grand prize, it was a huge hit among the target audience. Kelly Moran, a PAT senior studying piano performance and composition with Stephen Rush, wrote a piece that combines the acoustic piano with electronic sounds she created in a program called Kontakt, by plucking and e-bowing the actual strings inside the piano. Kevin DeKimpe, a senior with a focus in composition, calls a PAT degree “the most versatile music degree you can get.” He wrote the score for a 90-minute film that was later screened at the Sundance Film Festival. "I networked like crazy," DeKimpe says. "There were opportunities to meet all the composers and directors in the festival. It was clear that at 22, I was the youngest composer there. But overall, it was a great experience that could of only have happened at U of M."
And the beauty of it all is that graduates are finding jobs. “It’s about currency in the field,” says Rush. And reality bears it out. Two recent alumni are part of a team at Shure Systems that developed an inner-ear monitor, a major breakthrough in how musicians hear what they’re playing. It was used at this year’s Super Bowl half-time show. Another grad heads up the iPhone team at Apple. Nate Cartier, ’01, also in LA, works as a video editor for promos, commercials and music videos, as sound designer for pilots and independent features and on music and score mixing for film. A promotional film he sound designed recently won a CINE Golden Eagle Award for Best Short Film in Business/Promotion. Since 1985, the Performing Arts Technology program has been adding strategically to its faculty. Along with five from the School of Music, Theatre & Dance, there are shared appointments with engineering, art & design, and computer science. GEORG ESSL, the newest hire, is a classically trained musician and electrical engineer who founded the Michigan Mobile Phone Ensemble, teaching students to program their iPhones into amazingly versatile and highly portable musical instruments. GREGORY WAKEFIELD, from the College of Engineering whose research focuses on spatialized auditory environments and the analysis of the singing voice, has taught courses and mentored students. JENNIFER FURR, a lecturer in the program, is a composer who teaches computer music and digital sound synthesis. ANDY KIRSHNER, also in the School of Art & Design, is a composer and trained singer and actor who creates multi-media works that might include images, action, and words and ideas, along with music. Described as a “do-it-all entertainment wizard” by The Ann Arbor News, Kirshner’s latest work, Relive the Magic: An Evening with Tony Amore, was premiered and recorded by the Phoenix Ensemble, with Kirshner singing the title role. Jason Corey, department chair, teaches sound recording, technical ear training, and musical acoustics. He just released Audio Production and Critical Listening: Technical Ear Training, with seven software modules to practice hearing audio effects and processing. Mary Simoni is largely responsible for molding PAT into what it is today. Associate dean for research and community engagement since 2009, her research explores the creative possibilities of signal visualization, a way to graphically represent music in a field that has no standardized system of notation. Her latest book, Algorithmic Composition: A Guide to Publishing Music, with Roger B. Dannenberg, is forthcoming. Simoni also directs Internet publishing for the University and heads up Block M Records, the University’s own label. All repertory is performed, recorded, and produced by U-M faculty, staff, and students. The label gives PAT students invaluable experience in music production as they learn about audio compression, metadata tagging, and database design and management. Intermedia works are Moorefield’s current focus. His Five Ideas about the Relation of Sight and Sound creates a sonic world immersing the audience in music and visual displays generated by the way the instruments are played. Moorefield teaches The Producer as Composer, drawing from his book of the same name, taking students up through producers like Phil Spector, with his “wall of sound,” Brian Wilson of the Beach Boys, Brian Eno, one of the principal innovators of ambient music. The class explores the shift away from the convention of recording as a strictly technical attempt to capture a live performance to the notion of the studio as a musical instrument, with the roles of producer and composer merging into one. Stephen Rush, a classically trained composer and pianist, directs the Digital Music Ensemble, best known for the annual Gypsy Pond Music, staged at the end of the fall semester. A “sonic, site-specific installation involving sculpture and algorithmic computer music,” it uses the pond behind the School as a blank canvas. Students float wooden labyrinths or Japanese lanterns out onto the water. Touch and movement sensors activate sound and light. Each year is different. Rush’s campus office looks like some storage unit for the artistically possessed: PVC pipe with piano wire; a “noise sculpture” bedecked with Christmas bulbs and pop cans; parts of disassembled computers strewn about, like the laboratory of some mad genius. Along with his work in PAT, Rush teaches composition, theory, and jazz. Erik Santos is a composer, multi-instrumental­ist, and singer active in musical genres from rock to classical to electronic to music for theater and dance. On both the composition and PAT faculty, he teaches computer music composition.